Yesterday, Barry Graham favored us with his Top 10 Cities to Get Drunk In, numbers 10-6. He also included a few guest entries from some of his favorite drinker/writer/travelers, and those are below. Check back in a week for Barry's Top 5. I have, either fortunately or unfortunately, been drunk in too many cities, but for this I'm gonna narrow it down to Monterey, California. This is, actually, not all that great of a city to get drunk in, if you're the kind of drinker who prefers late nights. The bars close at 2 AM, and there aren't a whole lot of them in the first place, and everywhere is a no smoking zone. But one place I used to hang out at is the Mucky Duck in downtown. They have an outdoor bar there, with a fire pit with benches arranged round it. Since this backyard was out of doors you could smoke there, which I did in abundance. I used to hang there with my little brother, who worked downtown at a men's fine clothing store. So he'd show up after work in a suit and we'd drink beer and hang and wait for the ladies to come pouring in. One night a fight broke out and the bouncers were herding people out through a gate in the fence that fenced in the backyard. This bouncer was pushing at me and I tried to explain that I was waiting for my brother, and I was wearing a baseball cap at the time, and the bouncer just flipped my hat right off my head into the gutter. Let's say I'd had a martini or maybe a single beer, just for the sake of saying it. I reared back to deliver my punch when my brother came out of the crowd, grabbing me around my arm and hauling me off. This was yet one more occasion in which I was spared the confines of the Monterey County Jail. But there are fine things, too, about a drunk night on the Monterey Peninsula: any given night the fog rolls in before dusk, so even on the rare days when it's actually hot it always cools down, and you can watch the fog sifting through the Monterey pines on Jack's Peak. The sea lions bark down at Fisherman's Wharf, and you're always mere steps from a stroll on a pier or the beach. It's a great place to get drunk with a pretty lady. Nice restaurants, and waves crashing against granite, Spanish moss clinging to coast live oaks. These days I'm no longer that young idiot trying to punch a bouncer for tossing my hat. I don't go places that require bouncers. I hardly ever leave home, and I don't smoke. The best town to get drunk in for me is while sitting at my dining room table. The once thriving factory community known for its textiles and buttons, Easthampton, Massachusetts is now a thriving home to artisans and artists who fill the renovated factory spaces with paint and poetry. From Main Street to the newly dubbed cultural district of Cottage Street, this mini-city’s core is quaint and compact. To the west there’s the backdrop of a mountain upon which the mighty Dr. Seuss himself once sat. In fact, Easthampton is Whoville and the mountain is Mt. Crumpit. And there’s beer. Gallons of it. Good beer. Local brewery beer. A nitro-carbonated porter infused with coffee. A delicious ale made by mistake. And bars. A bar that’s also a music store. A bar in a cellar with amazing buttermilk fried chicken and beer. An early morning bar that caters to the 3rd shifters and serves up breakfast, lunch, and dinner (hot pockets, hot pockets, and hot pockets). There’s blue blood in this city and it’s squeezed from the blue collars that still and will always live here. There’s a swirl of honesty, a confluence of street smarts and academia. And there’s the cold crush of winter. Which, naturally, means more beer. There are cities that have driven me to drink, and cities that inspired it. Though I believe that drunkenness is more a function of who you’re with than where you are, I have to endorse Pittsburgh as a pretty great place to get drunk. Pittsburgh is a friendly drinking city. Maybe because of the sports. They love their sports and celebratory or consolation drinking. You’re pretty much never drunk alone. 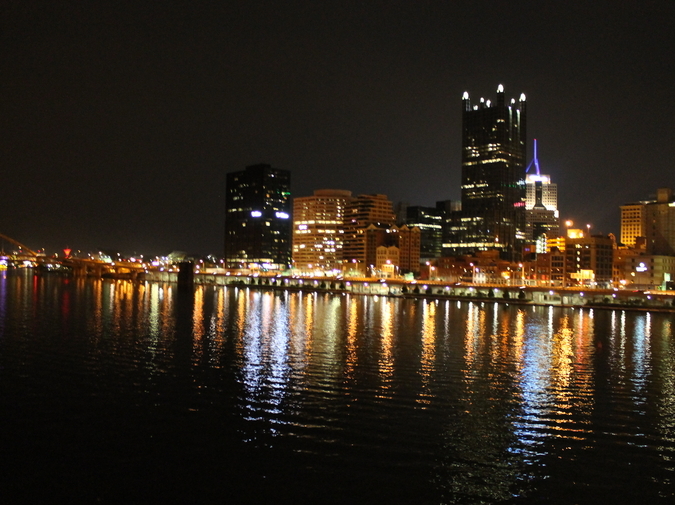 I lived in Pittsburgh for four years during law school and the year after I graduated. I remember one drunken episode (vaguely) for adding a first to my “embarrassing activities while drinking” list: my first hurl. My best friend from college was visiting and we went to this Spanish restaurant on the South Side with my neighbor, ostensibly for paella, but mostly for about 1000 pitchers of sangria. I don’t remember the paella. At least not going down. I remember my friends pretty much dragging me down the street to a coffee place. I didn’t order coffee, but the place had a pretty nice restroom. On another occasion, I got drunk with a rugby team. It was not as bad as it sounds. They had just won a match and were more into beer and dirty songs than molesting girls whose friends had dragged them to a rugby game. I did wake up the next morning, pulled the covers off my face, remembered part of the day and evening, and pulled the covers back over my face. That one has happened in a lot of cities: Newport Beach, San Francisco, San Diego, Denver, Austin. I wish I could say it won’t happen again. If I acted my age, it probably wouldn't. But, as my contracts professor said, if my grandmother had wheels, she'd be a bus and we could all go for a ride. Law school wasn't completely useless. It's probably not so good to take too much pride in becoming a heavy drinker at a young age. But there is nothing wrong with taking pride in your hometown. And as Buzzfeed is happy to inform you, my hometown of Binghamton, NY, is home to the Spiedie, a most "perfect and important sandwich." We can also claim Rod Serling. And if you think about Binghamton writ large, you may know that Billy Martin died there in a drunk driving accident as well. A point which may not be a good stepping-off point to my suggestion that Binghamton belongs in any and all discussions about good places to drink. But Binghamton is also the 10th rainiest city in the United States, and if not for bars, what else would we do? As teenagers we spent most of our time drinking in the woods or homes where parents were away, but as I got older I came to embrace the wide-range of bars Binghamton had to offer, The Casa Linda, Fitzie's, Sharkey's, The Pine Lounge, Uncle Tony's, Carnsie's Irish Pub, South Side Yanni's, and my long-time favorite Thirsty's. These are neighborhood bars. Places where you always see people you know, the floors are sticky, and the drinks are cheap. Some of these bars are still open, others are closed, and while I know so much of my affection for them is driven by nostalgia, they are all still vibrant to me, live on in my imagination, and populate my stories. I haven't lived in Binghamton for many years, but I can never can quite shake it, and have no intention of doing so anyway. If I’m going to drink anywhere, it’s the city of brotherly love, the city where I got my first underage drink at Chris’ Jazz Café on the corner of Sansom Street, the same bar where I first got alcohol poisoning, home of Dirty Frank’s on the corner of Pine Street, where I racked up massive credit card debt going around the corner to the ATM at Jay’s Deli, and once watched George Clinton’s drummer O.D. in a tiny men’s room, voted the dirtiest in the city, or the Locust Bar where I watched a hold up and then watched everyone go right back to finishing their beers with empty pockets, or Harbor Lights, where if you stay after hours all beer is 50 cents or Anthony’s where Colt 45 is always on tap, need I say more? I love that city with my whole liver.